Physical Education Teacher Education (PETE) graduate student Jared Johnson gets a lot of activity on the volleyball court, but his routine doesn’t stop there. He’s been fit his entire life and enjoys changing his routine and trying new things to keep it fun and interesting. Growing up, Jared was always active. In high school he played basketball, golf, tennis and track and field After high school, he added new activities to his list, such as lifting, yoga, step classes, bouldering and hiking. He still has activities he’s dying to try, such as surfing, because he thinks it looks fun and would be a great full body workout. These days, Jared mostly plays sand and indoor volleyball to stay fit. He’s an officer for the OSU men’s volleyball club and has served as secretary for the past two years. He plays the libero position, the back-row defensive player who wears a different colored jersey. 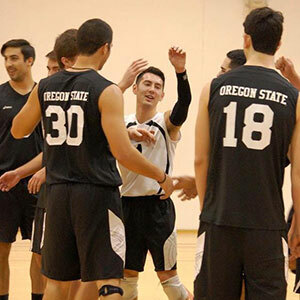 This year, the Pacific Intercollegiate Volleyball Association named him Most Outstanding Player. Equally important as his game are his warm up and dynamic stretching routines, which helps him break a sweat and get his muscles firing. Injuries have challenged Jared’s game in the past, and he relied on physical therapy to get back on the court. He also places school as his top priority, making it challenging at times to fit it all in. He says that in the end, physical activity has played a crucial role to his success as a graduate student. He’s managed to sustain a 4.0 and make the dean’s even during the terms he had 19 and 20 hours. Jared’s personal fitness philosophy involves getting his heart rate up each day through some type of physical activity. Jared recently graduated with a bachelor’s degree in Exercise Sports Science. Obtaining his master’s degree in PETE is a natural fit. Jared says that doing activities he enjoys, having friends that keep him accountable and not fearing failure are important elements to staying physically fit. He also enjoys the occasional chocolate chip cookie or cookie dough from time to time.